Behind every PAX East cosplayer is someone who had to learn new techniques and grapple with costume malfunctions. Costume malfunctions happen to just about every cosplayer. During each photo opportunity on the convention/expo floor, cosplayers are aware of pieces that need fixing for the next appearance. 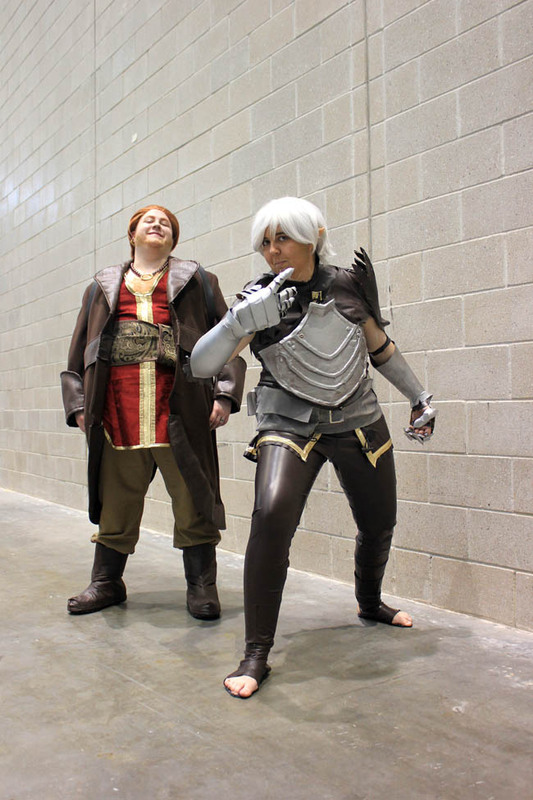 Even with that frustration, cosplayers Ashley and Sarah were excited to walk through the front doors of PAX East 2014 as Dragon Age II's Fenris and Varric. Ashley (cosplay alias is AVY Cosplay), has been cosplaying for about a decade. In that decade, new materials have become available, cosplay wigs have become easier to find outside of Chinese eBay sellers, and cosplayers still love to talk shop. 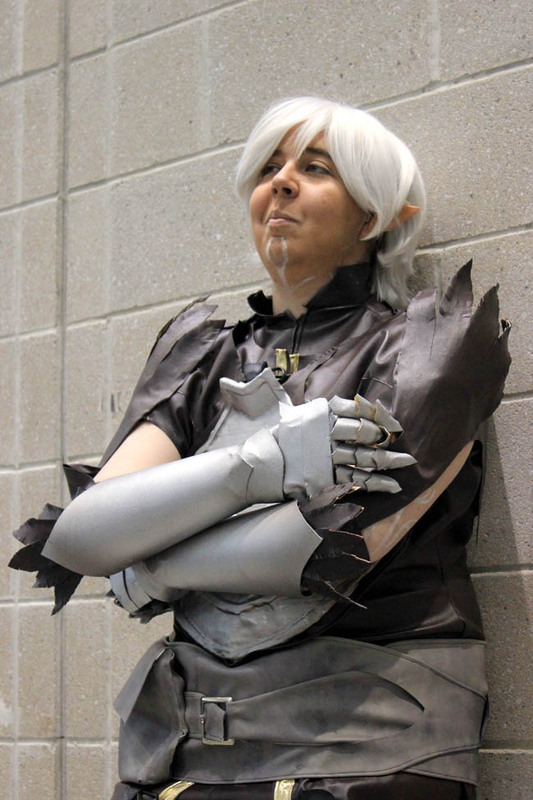 Wearing a white wig, leather, and armor made from thermoplastic, she cosplayed Fenris from Dragon Age II. 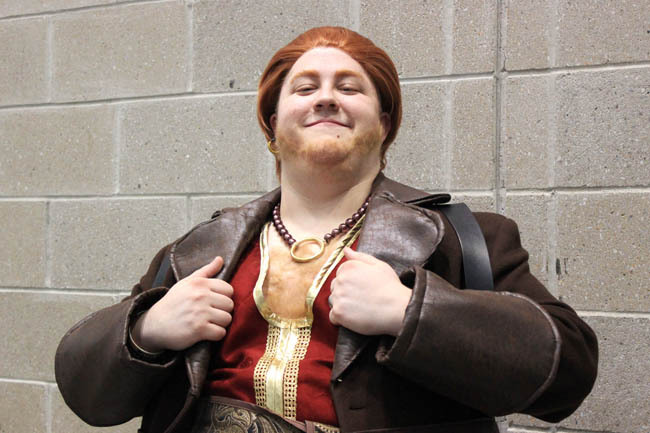 With her was Sarah, nicknamed Wolfie, who went all out for her Varric cosplay from the same game with fake chest and facial hair. The pair took off gauntlets and coats as they sat in the tabletop lounge to cool down. 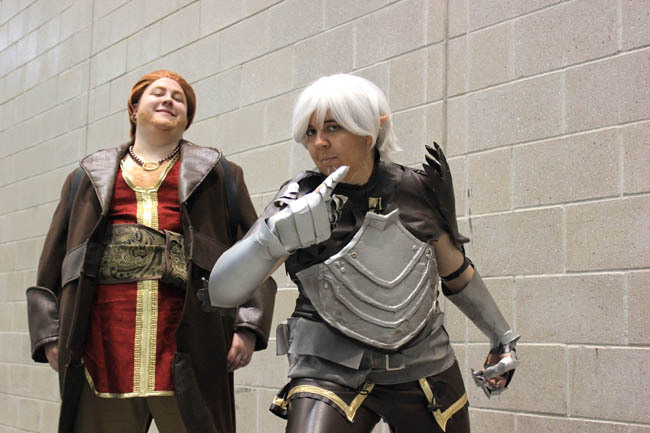 "Fenris is one of the costumes I've wanted to do for a while," Ashley, who has also cosplayed as Hawke and Zevran from the same series, said. "He's a lot of why I got into the Dragon Age series. He was always a costume that was going to happen for me. I love the character design, and he's such a fun character -- totally not like me in any way, but that's what makes it great." Even so, Ashley expressed some disappointment with the way the costume shifted around in ways she hadn't predicted. Taking Fenris's character art, which shows his clothing being unconnected in the back, and getting it to sit right took a few attempts. "It was a little difficult figuring out proportions because Fenris is built like a basketball player, and I'm obviously not," she said. "He's so lanky and yet he has like a Cloud buster sword [from Final Fantasy VII that he uses." That disappointment didn't stop her from showing off her favorite part of the costume -- the gauntlets. "They're spiky and cool, and above all they make me feel like Fenris," Ashley said excitedly. A costume malfunction earlier in the day left one of them falling apart, and while it was fixed later on, by that evening the costume was ready for a break. This happens so often to cosplayers, and it's a part of learning. Sarah plans to remake her bootcovers for Varric, which were slippers covered in fake leather at PAX East. A huge part of cosplay is making do with what you have. Sarah said her current project is tweaking her costume for New York Comic Con. "Don't be afraid to mess up and make mistakes because that's how you figure it out," Ashley advises new cosplayers. "Every costume that I have made has had something I'm not totally happy with the first time. And every time I go onto the next costume, I learn from that, and I build on it, and that's how you learn new techniques." Ashley laughed and pointed out that she had tried to pattern Fenris's tight pants in 2-way stretch fabric with 4-way stretch pants. Because the fabrics stretch differently, a pattern based on one kind of stretch fabric didn't work out for another. Sarah, who has been cosplaying for about two to three years, is also learning -- specifically about embroidery, a handicraft that involves decorating fabric with specific stitches. 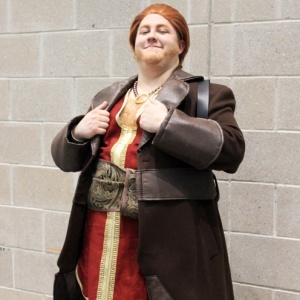 Her tunic for her Varric cosplay was made from scratch, and it's one of her favorite parts of the costume. Even with the embroidery it has now, Sarah plans to add more to it having just learned how to embroider. But what got Sarah to pick Varric was the character's coat. 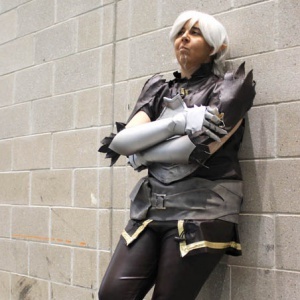 "Based on my experience, I would [tell new cosplayers] to pick out a particular thing you really want to make - like, not just say, 'This is kind of a neat outfit. I'll figure out what to do with it,'" Sarah said. 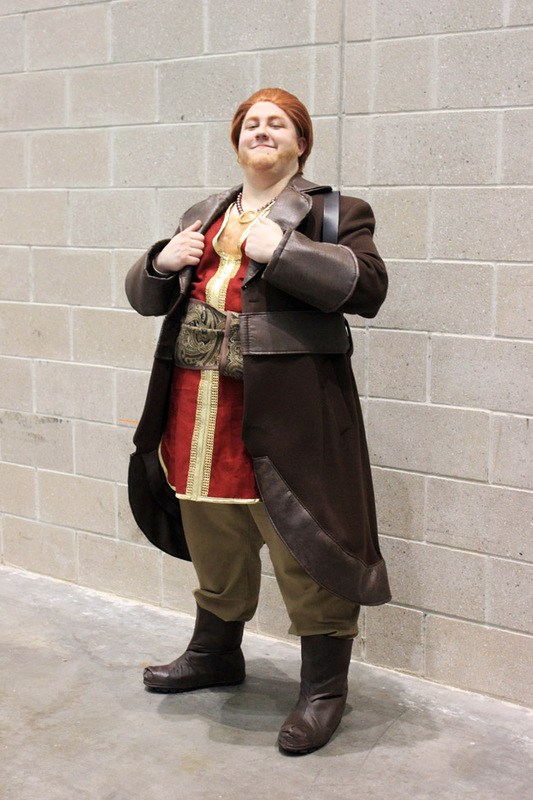 "I picked Varric partly because I love that coat. That is a cool coat, and I want one." The coat was a piece Sarah thrifted and then modified. Even though she didn't have to make the garment from scratch, working with a piece of already finished clothing is difficult. "There are a lot of things you would do before closing up seams, but they were already closed," she said. "So there were some tricky parts of getting things through the machine because it was already half-finished." Sarah added she was very proud of her alpaca wool, which she attached to her chest and face to go the full nine yards as a Varric cosplayer, giving herself what she jokes as "luscious chest hair." Cosplay is a hobby in which you never stop improving. Mistakes are a part of the journey. As a result, a seamripper is a cosplayer's reluctant best friend. "I had to order spandex and through lots of trial and error, had to do lots of seamripping when I messed up," Ashley said. 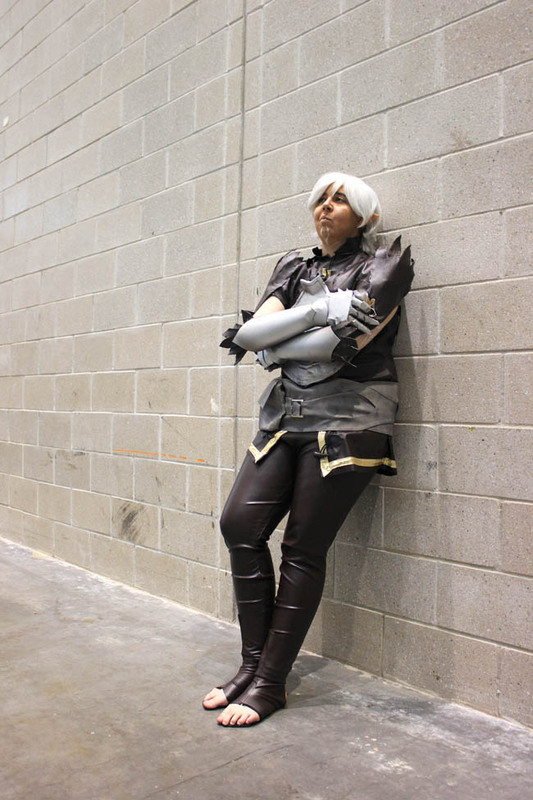 "But I also got to use for one of the first times a thermoplastic called Worbla, which you can heat up with a hair dryer and a heat gun to shape the material; it's really big in video game cosplay." Ashley advised using a heat gun over a hair dryer, though. Cosplay also gives fans an easier way of approaching one another. Sarah usually does not start conversations with strangers out of the blue, but when she is in costume and sees another cosplayer, she said it gives something for her to talk about. But when you get down to it, after the stress of transforming character art into garments and props, cosplay is fun. "You can be anything you want for that day," Ashley said. "You can get out of your regular day-to-day habits. I'm nothing like a lot of the characters I end up cosplaying, and that's part of what makes it really fun - it's the escape." With a laugh, Ashley added, "Besides that, cosplay is pain and discomfort! But fulfilling at the same time once you get through that part." From here on, Ashley plans to continue cosplaying from BioWare's franchises. Her next costumes include comic book characters, but her next ambitious project is Mass Effect's Liara T'Soni. Sarah has no specific plans yet beyond continuing to work on her Varric costume to make it the best she can. Cosplay is fun, it can also be painful, but it also means learning new things with each project.